This is one of my favourite runs and this year there were quite a few Striders taking part. It was a beautiful day for a race, still, sunny and not too cold. It was a bit muddy and parts of it felt very like cross country. The first half contains quite a bit of uphill, but that makes for an enjoyable second half. The race goes through some lovely countryside including Studley Roger deer park. As we ran through, Melanie and I saw two separate herds of deer, one of about twenty five and the other close to a hundred. After we finished we were talking to the Striders and hardly anyone had seen the deer, Melanie and I were accused of having mid race hallucinations ! Many congratulations to Rachel Terry who won her age category ! Also to Rachel, Jackie and Melanie who were the third women's team to get home. And to Lindsay who was running his first 10k. Jon's turn for relative visiting saw us heading north via Eastbourne after Christmas and never one to miss either a parkrun or a parkrun tourism opportunity we decided to give Eastbourne parkrun a go after a very nice evening spent with his Aunt and Uncle. It's a reasonably small parkrun with only around 100 regulars but is run mainly on a narrowish path so in this case smaller is definitely better! Some lovely friendly people though, one of their regulars came and had a chat with us beforehand which was a very nice touch. The course is an out and back and almost entirely flat barring an underpass/bridge bit. It had been mercifully dry before the start but about 2 mins in to the race it started absolutely chucking it down, to the point where the raindrops were actually painful, and with tired legs from Christmas Day parkrun and the day before's 9 mile training run I wasn't exactly full of post-Christmas cheer. The marshalls were very encouraging though, and with it being an out-and-back it wasn't long before the fast chaps (incl. Jon) were passing on their way back with words of encouragement, so I dug in and made it to the turnaround point - only half a parkrun to go! The way back was relatively uneventful other than puddle dodging and trying not to yell at the people who kept sprinting then stopping in front of me, and I finally crossed the line in a rather bedraggled 28.19, a shame really as on a nice day I reckon it is a pretty quick course. Jon fared much better than me coming in 12th in just under 21 mins, and was also chipper as I'd suggested he leave his jumper under a tree rather than on the fence, so he had something warm and dry to wear for the long haul back north. I was glad we had gone anyway and would recommend it as it is definitely a quick course for anyone who feels the urge for a fast PB but doesn't mind driving the length of the country to get one! Two lap course, twice up quarry side. The stretch along the moor edge tested everyone with gale force wind. Pulled head buff down and neck buff up to leave only an eye slit. Thought of the day was 'Eat more mince pies' - to weigh me down as blown sideways. Mike Bennett,1st MV55 and I, 2ndFV60, presented with summer series certificates and wine and more for age cat. placings on the day. Jon and I were down on the South Coast visiting my family for Christmas and couldn't resist squeezing in a parkrun while we were there. Due to a late arrival on Christmas Eve and general knackeredness we accidentally slept in on Christmas Day and therefore had to rush the present opening a bit to get out of the house on time (much to my sibling's annoyance! ), but fortunately my folks are only 5 mins drive from the Common so we made it in good time and joined an impressive 267 hardy souls, a large number of whom in fancy dress, who had braved the weather and sibling wrath to turn out. I've done this parkrun before but the course had changed since the last time to avoid having to go over the muddy grass so it was a simple two loop run up towards the back of the common and then back down. "Up" being the key word here, its not steep but it is a bit of an energy sapping drag, especially when you know you have to do it again, all the while dodging fallen trees, but it was pleasant enough and I wasn't after a PB anyway (or so I keep telling myself). Jon had a good run finishing 41st in just over 21 mins, I plodded round in a somewhat reasonable 26 mins dead, then it was back home to finish the present opening and give thanks for the gift of bacon sandwiches which had been prepared while we were out. It's an unusual way to spend Christmas morning indeed but one I think will be part of the Steed family traditions for years to come. Leading up to Christmas we were asked the usual question of ‘what are your plans on Xmas Day’. I do not think some people quite expected the answer of ‘parkrun’ and gave us some odd looks. However we turned up, on what was a crisp but sunny morning, to find over 100 other people with the same idea. Over double the number of people who came to the one they put on last year. Included in the turn out were Striders, Jan Y, Denise B, Michael R, Claire R, Mike H and Stan W.
The parkrun is two laps of the very scenic Hardwick Park, which takes you past follies, a lake, through trees, etc and it is my favourite parkrun course. For xmas they ran the route in reverse for a change. This course looks especially nice on a sunny morning like this one and it really reminds me of why I am out here doing this. 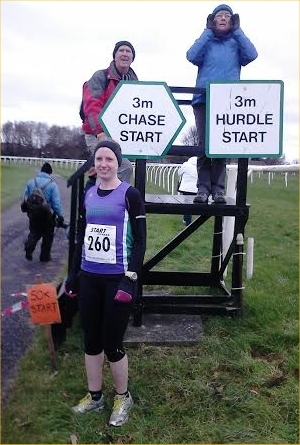 Well done to Claire R who came in as first female. There were no marshalls other than for scanning and timing, however they were busy making tea and coffee ready for everyone as they crossed the line, with an assortment of goodies including mince pies and cookies. 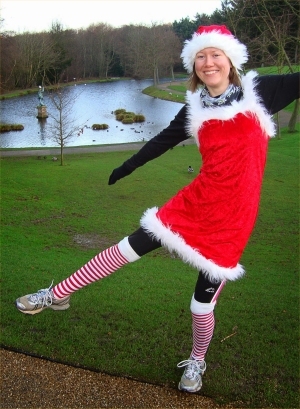 A lovely atmosphere and thanks to the organisers who made the xmas day parkrun possible. 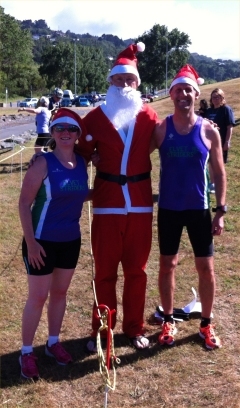 Basically, see last years report for Lower Hutt parkrun, December 2012 but imagine Santa outfits, Christmas hats and a 9:00 am start. We arrived early at the course and met the race director Richard McChesney. Richard, a very keen runner, had been living in the UK for a number of years and was very excited to bring the parkrun concept back with him when he returned. Richard, with his younger son, Zac, another keen runner, were 'parkrun tourists' around the UK so are well aware of the ethos and practicalities of being involved with parkrun. Richard was instrumental in getting the Lower Hutt parkrun started and it has proved to be very popular - information from parkrun.co.nz pages. We also met a couple of ex-pats before the race. Well we spotted a T-shirt saying 'Sunderland Strollers' which kind of gave the game away. They had moved to New Zealand a few years back and now lived nearby. Paul, the ex-Stroller, invited us to a barbie for Christmas Day but unfortunately we couldn't make it, but a lovely thought. We were off, it's a great course along the Hutt River, a bit up and down in places and still a headwind on the return journey but scenic and good paths. Like last Christmas it was very warm considering it has been raining and gale force winds the day before, we were very lucky with the weather. Paul beat last year's Christmas time and so did I, so all those fish and chips and burgers haven't done too much damage I guess. Another parkrun done, another great course and fantastic volunteers. Who knows where we'll be next year, come on South Island get your parkruns on (although one is starting in January, hmm). It was a morning of, shall we say, varied weather conditions for which, has to be, a record entry for the 2013 Christmas Handicap. We had a record 40 runners entered, 33 of which started and 31 finishers. The theme this year was 'Fantasy - however, you wish to interpret it' - and Striders did us proud! There were some fantastic costumes so that Santa and his Elves had a hard time choosing the winners. Chairman Tom led the first runners off - very gently I imagine after his 38 mile romp around Hellvelyn yesterday (ouch!!). At this point the sun was shining and the sky was bright.it was just when we got to the back end of the field - the fast lads and girls were greeted with darkening skies, a distinct drop in temperatures and heavy rain which seemed to sharpen into hail at one point. Resourceful Strider supporters, recorders and various race officials responded by attempting a Guiness book record for how many people you can squash into a bus shelter ... without having any intention of actually catching a bus! We were treated to an incredible double rainbow - beautiful but hey, it doesn't keep you warm! And the runners all hurtled home some 61 minutes after it all started. There was a mass dash to cars and to MC - if anyone really did want a shower and then we headed off to the pub. The first runner home was Ann Towers in 48.02. Fastest man was Neil Sleeman in 34.10 - 1min and 1 second ahead of Jon Steed who finished in 35.11. Fastest woman was Megan Bell in 37.48. First junior was Erin Keeler-Clark, Joanne Richardson's daughter, who finished in 41.42. 1st prize and best woman went to Anita Clementson as Edward Scissorhands. Best male went to John Greathead who was a cheerleader but looked like Britney Spears gone wrong. Runners up were Dave Robson (either the Grim reaper or a very sinister monk! ), Sophie Dennis as Minnie Mouse, Melanie Hudson as Maid Marion, Kerry Lister as an angel and Victoria Downes as a very wicked fairy! 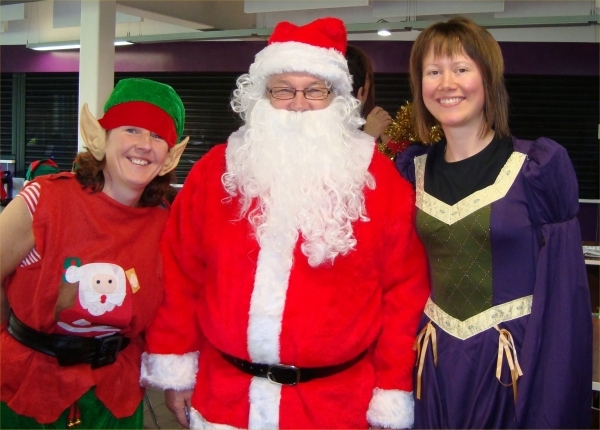 Went to Jon Steed - for almost being fastest man; Stephanie Walker and Fiona Kinghorn Jones and Mandy Dawson who out-elved Santa's real elves. I'd like to thank everyone who took part today, all the supporters, marshals, people spotters, recorders, those who looked after other people's children and to Phil who adorned the woods with gold tinsel! This is a fantastic run which I think would be perfect for a Grand Prix event and has been in previous years - as recently as 2008/9 in fact. I first ran this in 2011 although confusingly this was the 2010 event, delayed by weather conditions from its usual pre-Christmas slot. 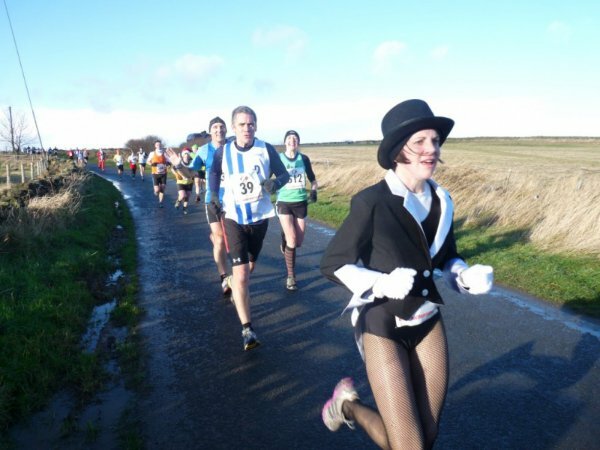 In my race report from then I mentioned seeing a load of runners get off a coach in fancy dress, mainly in babygrows (as they were known then, you may now know them as 'onesies'). It turned out they were Blackhill Bounders, and it turns out that this is a big traditional race for them. I've worked closely with a lot of Bounders especially since starting Blackhill parkrun and they're a fantastic, friendly bunch as you'll know if you've run at their parkrun or at Snod's Edge or the Gibside Bowl which they also put on. So, when I heard they were putting on a coach again this year I asked if they could squeeze me in. Joining the coach at Sniperley Park and Ride I was immediately made very welcome - within a few minutes of sitting down I was offered a shot of something sweet and alcoholic, another Bounders tradition. Well it would have been very rude to turn down their hospitality wouldn't it? As the coach drove down to Loftus, just over an hour or so, we seemed to pass through every type of weather and I became increasingly nervous. About 7 of the just short of 8 mile course is on roads/paths, but the rest is on muddy field - I only had road shoes with me and I was beginning to regret it. At the registration at Loftus Leisure centre (note to self - bring swimming kit next time) I bumped into loads of other friendly faces including Graeme and Katy Walton (in fancy dress as a showgirl), Jon Ayres, John Hutch, Sarah Fawcett and Jackie McKenna, with her son Andrew. A brass band was playing Christmas Hymns and loads of other clubs were there - some in 'normal' running vests, many in fancy dress. Compromising, I plumped for Turkey headwear although some wag on the route suggested I looked more like Chelsea goalie, Petr Čech. My run was pretty forgettable, started off well enough, but obviously too fast as I ended up having to walk for a good section at the top of the course, the second stretch of muddy hill was the final straw as for the second time this weekend I saw our lady secretary disappear into the distance. This is getting to be a regular occurrence now - I'm going to have to up my training in the New Year. I can't even use the excuse of Saturday's Saltwell 10k being in my legs - Katy was there running that too. Having said that, this race isn't really about the run, more the atmosphere and encouraged by others who passed me once I hit the top I resolved not to walk again and ran all the way back downhill. Once back at the centre there was a nice long sleeved T-shirt as a prize (this was the 30th running of the event). Mince pies and mulled wine were also on offer although I didn't partake of either. I have to give a quick mention to the winners prizes too. The top 3 men and ladies each won what looked to be a whole supermarket trolley's worth of shopping, a full Christmas dinner kit and there were loads of turkeys for other category victories. Many fancy dress runners got a bottle of wine too. On the way back on the coach the Bounders bus stopped for a great carvery at The Water Wheel Inn at Liverton right on the edge of the North York moors. The staff there coped admirably with the sudden influx of a coach load of hungry (and thirsty!) runners and the Bounders also put on a quiz which was also fantastic. All in all a grand day out, many thanks to Blackhill Bounders for letting me tag along and making me feel so welcome. I last ran this race around 12-13 years ago when I was more of an occasional runner albeit quite a bit younger. My memory of it from back in the day was that it was tough, muddy and long! With Katy by side (as per usual, I think she races more often than Alister), we headed down to Loftus on a breezy Sunday morning. Race HQ was the local leisure centre and it was there where we bumped into some fellow Striders. Fancy dress was optional so there where many a costume to admire, none more so than Katy who was sporting a show girl costume that included top hat and tails with fish net stockings!!! Eleven o'clock arrived and off we went running away from a rousing brass band and straight to the opening climb. This climb continued on and off for around 2 miles through housing estates and onto some winding country lanes. Just as the climbing eased off the next challenge presented itself by way of a ploughed field! There were a couple of options here, either along the rutted track or a softer but flatter option on the aforementioned field. I went for both options for the fun of it although I would say that neither were particularly easy. After a nice little downhill section we left the field behind, took a sharp left and were faced with a long tough slog up the road. At the top of this we were once again directed onto some terrain that would be more suitable in the Harrier League. A steady plod up here followed by a tough uphill tarmac section to the summit of the course had me breathing heavily with the wind howling. The final 3 miles of the route retraced a lot of the opening section so needless to say it was mainly downhill. I managed to pick up the pace and at one staged my watch had me going at sub 6 minute miles (obviously a steep downhill section). I came home in a little over 55 mins which is a 4 minute improvement on my younger days, a testament to how running with a club improves your running. It wasn't long until Liza Minnelli (Katy) followed me in grabbing herself a bottle of wine for her fancy dress efforts. Well done to all Striders concerned on a tough course in tough conditions. "Now in its fourth year, the TdeH has fast become a classic ultra run. Traditionally run on the shortest Saturday in December the route is a tough circuit around Helvellyn starting and finishing at Askham on the edge of the Lakes. The distance is 38 miles with several thousand feet of ascent and descent. The terrain is tough mountain trails and so fell running and navigational skills are essential. Entries are strictly limited to experienced and competent entrants. This is not an event for novice trail runners…!" Having done over 250 organised runs now, you'd think it would be impossible for me to find an established one I haven't yet done. Turns out there are still plenty, including this, proudly billed as England's oldest Road race. The weather was lousy for this one - rain, wind the lot - right up to the start when suddenly it stopped. A big Striders turnout stood on the start line so obviously we were all attracted by the last big chip-timed 10k of the season, or maybe by the whisky miniature and shot glass which was very unusual. I don't think it can be because of the prospect of a fast time as if that's what you're after then I can point you in several other directions. I'd recently done the Gateshead parkrun held in the same park so had some idea that the terrain was 'rolling' but this managed to cram in even more climb and descent. The course is three and a half laps and finished on the only grass on the course which led to some 'You've been framed' moments as runners suddenly hit the sodden grass. There were great performances by Rob Everson and Richard Hall for the men and Katy Walton and Claire Readey for the ladies as well as brave performances from many others, Kirsty pipping Jacquie for the umpteenth time this year, Denise and Kerry continue to improve as well as a welcome return for Emma who looked as if she had a great work night out the day before... Many thanks to Graeme Walton and all the other supporters - those cheers for the purple really keep you going as you are suffering, and I did plenty of that. 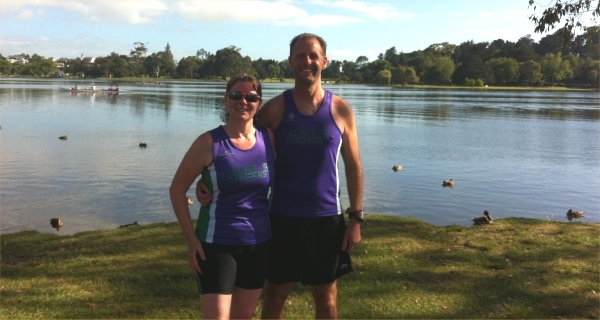 We've been waiting for a few years for Hamilton to put on a parkrun as we have visited Lake Rotoroa quite a few times for a walk and to see the Pukeko (a wading Bird). Finally we spotted (not that I'm stalking parkrun NZ or anything) that a parkrun was coming to Hamilton. Would we be able to get to it during our holidays, too right we could, or no worries mate as they say here. We turned up outside the Yacht Club, where the start is, in good time and immediately were greeted with enthusiasm and friendliness. We were informed about the running club, the course and how proud they were of their runners, especially the family that had attended all 10 runs so far and how the little boy had knocked so much time off his first run/walk and how he really enjoyed it now. That's what parkrun is all about. Anyway we set off on a glorious sunny morning, no strong wind like the night before, at 8:00 (the start time in New Zealand). The route is one lap of the lake on path and boardwalk then a little add in loop on grass to make up the 5k. After dodging the Pukekos and geese it was a good run with a few twists and turns, feeling okay until just after the 3k (for both of us actually), then the feeling of the heat kicked in, but we carried on and even managed to avoid the cross fitters at the end (there was a group of people doing cross fit right at the finish, a Christmas treat for them doing it outside, yeah right). We thanked the organisers at the end and apologised that we couldn't go for drinks and cake as we needed to vacate our Motel. It is a fantastic location, we love it anyway, and would definitely go back. The magic of parkrun, the other side of the world but still the same format, great organisers and volunteers and the diversity of runners. Strider Locked in Toilet Shocker! This race was listed as a marathon - it turned out to be about 29m, you certainly get value for money at a Hardmoors marathon, all of them have been over the marathon distance. The race started and ended at Guisborough in North Yorkshire. Anna was helping out at registration and as there was also a half marathon and 10k, it was busy. There was a slight delay in the start of the marathon, we set off at 8.15. An early start, but the plan was to make maximum use of daylight (cut off was 10 hours). The half marathon and the 10k were being set off a little later. The day was dry and there was a bit of sun, but there was a strong wind. Soon after the start we were off road and climbing steeply through Guisborough Woods to reach the top of the first hill, High Cliff Nab which has wonderful views over Guisborough. On the way up we were overtaken by Jerry who was doing the half marathon and later Danny went by. We didn't see Mark and Anita Dunseith who were doing the 10k. Aaron was also doing the marathon but he was along way ahead of us and finished with a good time. From High Cliff Nab it was across the moors to Roseberry Topping. Rather than go up the direct route to the summit, we went round to the far side and up the steep route. It certainly was steep. Flip was marshalling at the top and I am not sure how he survived in that wind. Melanie was being blown all over the place in the short time we were up there. Then it was down a different way, before making our way back to the Cleveland Way and up little Roseberry, across the moor and down to Gribdale. Up again to Captain Cooks monument, passing two Christmas trees which were decorated with various Christmas decorations. Then off in the direction of Kildale, but then we turned north before we got to Kildale and went down into Gribdale again and then up to the moors again and back towards Guisborough Woods. When we got there we were at 12m and it felt like we had done much more than that. The paths over the moors were muddy in places and it had been mainly uphill since Gribdale. We headed down a valley passing through the edge of Castleton before climbing back onto the moors again. Then it was a slog back to Guisborough Woods and down to the finish. 6hr 40min, two hours longer than last week's 16 laps round Newcastle Racecourse, but much more enjoyable. Overall a very enjoyable experience which I am sure is going to be well remembered by Melanie. The compulsory kit check required a minimum of 500ml of water to be carried. There were orthodox ways in which other participants fulfilled this requirement. One man carried a pint of milk, dangling it from his pinkie, claiming he would carry it for 13 miles, sure! Another had a tea-cup tied to his bum bag: I dunno, maybe he was going to stop for tea halfway? We started off from Guisborough and the first 15 minutes had plenty of climbing. I was stuck behind a long snake of lycra-clad bottoms. Fortunately, the view improved when we reached Highcliff Nab; stunning views of Teeside and the surrounding country below. En route, I gave a wave to Melanie and Dave who were doing the full marathon. Later I heard that Dave had managed to get himself stuck in the loo. Was that his excuse for missing a "Pee B"? More details I'm sure from his report. The next highlight was the climb up Roseberry Topping. I managed to pass several runners including Mr Tea-cup by power-walking. At the top, I was greeted by non other than Flip, braving the wind and marshalling. I paused at the top for a few photos. Mr Tea-cup passed me on the downhill. We exchanged positions everytime there was a change in elevation, even managing some banter as we passed each other. Eventually I left him as he stopped at a checkpoint. Captain Cook Monument was next, followed by a run through the nearby woods then down into Lonsdale farm before ascending the moor again. I was getting tired at this point and pretty much on auto-pilot. Other runners were clearly flagging too giving me the chance to pick some off. I'm sure many of us started off way too fast at the beginning. The next I can remember was descending back into Guisborough through the woods. As always an exhilarating descent made more precarious by the slippery mud, ankle-twisting pot-holes and fallen trees. I labored back into the hall, my legs starting to cramping up. It was my hardest half-marathon since my first GNR (which I did with very little training). But its a breath of fresh air from road races and I'll definitely be signing up for more of the Hardmoors series which next year will include 10K's, halfs and full marathons. I managed to take several photos during the race. I'll put them all up online on my blog. A fine performance on the regional stage! 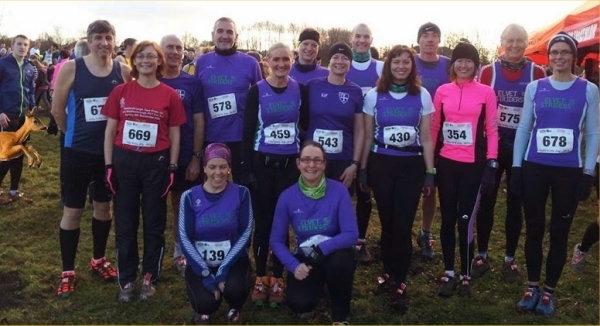 Saturday's NE X/C Champs saw another magnificent Striders' turnout of 31 runners! A blustery but mild day made the longer than HL courses seem even longer, although there were few hills to tackle and not much mud to speak of either. Adam's u/20 men's race was first up and he looked a bit lonely as the field was well spread out after the first lap. Nonetheless he had a steady race to finish strongly in the quality field. 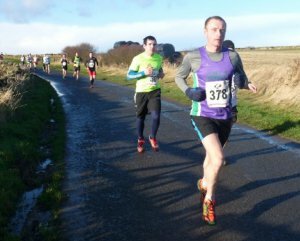 Fielding one of the largest teams of 19 runners the Striders senior men soon got stuck in to the long South Shields course. Will Horsley led the team home (no 'packs' in this race) followed by the still improving Rob Everson. Other notable performances included David Gibson's continuing return to form, Simon Gardner's amazing run - fresh off the plane from Australia and Alan Smith's encouragingly, gutsy performance! Well done to everyone who ran! Sally H, Rob's Dad etc). 361 finishers. Men's Team 20th of 27. 178 finishers. Women's Team 16th of 23. I woke up to the sound of my alarm at 7.15, and not for the first time wondered why I was getting up this early to go running when I could be laid snug in bed on this cold December morning. However I knew soon enough that I would soon have to go a meet Kerry, Karin and Kelly my fellow partners in crime for our trip to the Stockton Winter 5k trail race at Preston Park. 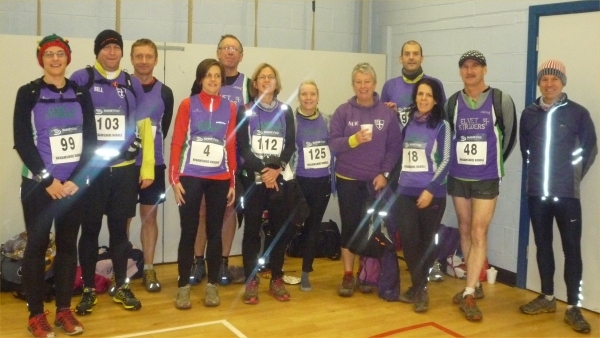 This was my first race on a local level and I was rather nervous, and we got there in plenty of time, filled out the necessary paper work, so number in hand we had a nice welcome cuppa and got ready for the race, meeting up with other Striders also braving the cold December morning. We watched the juniors come in giving a good cheer and clap for them (I love to see the kids race). Then time for a loo stop and the start line, there was a good gathering of runners and before we knew it the race had started. The race itself consisted of 2 laps around the park, part path and part trail. Things started off well nice little flat bit then down hill past the lake and the swan along the trail, then yes you guessed it a HILL, no!! panic!! I hate hills, anyway I gritted my teeth and up I went at the top it was a right turn and round the outside of the park past the butterfly house and back to the start. The flat and down hill bit was welcome but as I was running past the swan in the lake which I swear was smirking at the thought of me getting up that hill. I plodded along the trail to the "HILL" and gritted my teeth once again and I could hear the voice of Mike Elliot in my head saying just keep plugging away, don't give up now. The top of the hill reached and a left turn to come along to the finish and there he was the man himself, spurring me on and a sea of purple shouting me across the line yipee. My first race over with, so we all went in search of coffee this was not quite as successful though (note to self take a flask just in case). Presentations over with we all departed via the play area and a picture on the long snake swing. Still in need of coffee we stopped at MacDonalds on the A19, we weren't the only Striders with this idea ha ha. Now looking forward to my next race. This was a hard event for me to commit to as on first read it just makes you say "no thanks" and go looking for another event. The marathon course is 16 laps of a the very exposed race course in December it the north of England. Me being a fair weather running/tarmac loving southern softy, it was a hard sell. The tarmac path loop is inside the race course used for the horses which has a few hills thrown in towards the end of the loop. The golf course in the middle gave you something to look at and balls to dodge on the way round. I had already run my first marathon at windermere earlier this year and was looking forward to a flat easier and hopefully faster marathon this time round. As always with running, I have been on the way back from injury but still managed a good 9 week build up for this run. It was always going to be a gamble running in December but decided to go for it and give sub 3 hours a real go. My first marathon was 3:08 on a hard course and was confident that this would get the very large monkey off my back before 2014. Training went very well with some big PB's at 10 mile and 5K leading up to the marathon. Managed to hit 20 miles and 50+ mile weekly total a few weeks too :) so was looking good for the big day. Knew the weather would make or break my sub 3 and felt myself sinking as I checked weather reports for the day. I arrived early for the race which is held by North East Marathon club, a small marathon-obsessed organisation which holds cheaper small marathons round the north east. Communication with the organisation was excellent, the course was accurately measured and even had t-shirts/medals. This was the first time the event had been held here so a few small problems but nothing of real note. The coffee van was told to pack up by the groundsmen, even though the racecourse had no where to get hot drinks? A real jobsworth and a shame as I was forced to use the dreaded Mc D yuck burger house instead. We had a staggered start for each of the 3 distances running at the same time on the same course, this turned out to be quite confusing and annoying as numbers were colour coded but only on the front. This made it almost impossible to know for sure who you were racing against as we looped round and round. At the Start/Finish was the water station and the volunteers were great, lots of much needed cheers. The laps were counted for you but I was still not 100% sure i was on my last lap when i finished, a bit confusing for a first timer. The sub 3 hour time was never on for me on that day, the wind was unreal and with the course being so exposed, it quickly turned into a nightmare. Down the long straight getting battered over and over again, i Crossed the line with 3:11 ish on my watch and a horrible feeling in my head as again I told myself I had messed up my marathon. It would be easy to just blame the weather, or my stupid Nike+ watch, so I will. I planned to run at 6:50 min/mile pace or quicker for the whole run and my watch happily said that was what I was doing. Not till half way (the only possible check point) which i hit at 1h35, I realised that the thing was not working right and I had no strength to pick things up. The second half was strangely more enjoyable as I settled into it and apart from a slight dip at lap 13, held the pace ok. Just not in sub 3 shape yet it turns out, a real hard one to accept. Came 3rd which I am happy with but should have been able to hit that goal. So time to sum up this quite long report and well done for getting to the end :) A very enjoyable, well run event but at the Mercy of the weather due to being very exposed and in December. Very impressive runs by fellow striders with outstanding effort at 50K by Anna, made of stronger stuff than me. On to the next challenge and will continue my sub 3 hunt next year. More lessons leaned, still glad I did this race and would highly recommend any even organised by the Northeast Marathon club. When I first saw this race advertised I thought which nutters are they going to find to run 19 laps of the ambulance track of the Newcastle racecourse in December? Within 2 weeks I’d gone from no way, I’d rather shoot myself to it’s the only 50K in the north east and I fancy a new PB before Christmas. Having entered I still had my doubts as to whether I could mentally cross the finish line that many times before finally being told that I can stop but got stuck into training and decided that I’d give it my best shot. Day of the race dawned and it was nice and mild for December but there was a slightly concerning wind. On arriving at the racecourse conditions could definitely be described as blustery so having collected our numbers and race T shirt, I hate it when races hand out the T shirts in advance as if you are going to get the chance to wear it you really have to complete the race, we sheltered from the weather before being herded to our appropriate start lines. I wasn’t the only lunatic to enter, Bill Ford and Richard Hall stuck to the reasonably sensible half marathon and Gareth Pritchard, Melanie Hudson and Dave Robson took on the marathon. All the races went off at the same time but from differing points round the racecourse so the distance was correct. Now the race had been advertised as fast and flat. For a shorter race it would have been classed as flat but in reality the first half of each lap was slightly downhill with the second half being slightly uphill and yes you’ve guessed it, we had a headwind for the uphill! First few laps went by without too much stress, was being overtaken by plenty due to the half marathon and marathon start lines being behind the 50K one but there was no lapping going on at this stage. Phil had come to support and it was nice to see a friendly face at the end of each lap especially in the early stages when the laps seemed to flying over quite quickly. So we went round and round and I’d completely lost track of what lap I was on but I was trying to mentally shut off. As time went there were less people running as the half marathon folks finished and there were various DNFs and then the marathon runners started to finish. I was still passing people and being passed but unlike an ordinary race I had no idea if I was actually overtaking anyone as didn’t know which lap they were on. Bill once finished his race walked round the route in reverse so I must have passed him 3-4 times and each time thought I’ve got to keep running as I’m not going to be seen to be walking at this stage. Claire Readey, who had come to support, then also walked round in reverse, it was nice to see a friendly face on the more lonely areas of the track, but I think I’d given up the idea of no walking by this stage. My Garmin started to beep low battery at about 19 miles, my own fault as I’d forgotten to charge it properly but by 23 miles it had died and I died with it. Not knowing how many laps I had to go I mentally started to really struggle and my legs responded by refusing to run. Managed to force a run walk for the next 3 miles and finally got told that I had run marathon distance and only had 3 laps to go. Now even in my fairly knackered state I could count down 3 laps so decided I was going to get them over with as quickly as I could, my legs responded and I was motoring again. Finally onto the last lap and as I passed each fence, there were no other landmarks to count down, I knew I was going to finish. A final push against the headwind to the line, I don’t think I’ve ever been so glad to finish something in my life. Had been aiming for a sub 4.30 but had abandoned that target early on due to the wind so was happy to finish in 4.42. I’ve run further before but that has to have been the most mentally challenging race I’ve ever run, made so much harder by the blustery conditions. Finished saying never again and already thinking maybe, I’m definitely not finished with lapped races but don’t know if I’ll ever want to see that racecourse again. 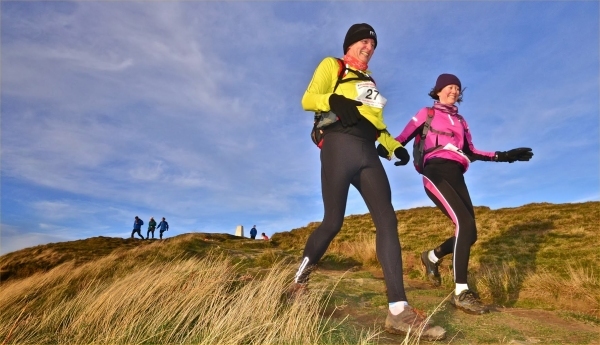 Sixth fell race in NEHRA Winter Series, starting from exposed car park on Westerdale Moor edge, Castleton, NYM. Fast gallop downhill to Dibble Bridge, across a youthful River Esk, skirt Westerdale Moor edge and cross Little Hograh and Great Hograh Moors against the wind, drop down into Baysdale and short steep ascent out, to have the wind on our backs along Kildale Moor edge, crossing Esk at Hob Hole by footbridge or foot wetting ford, steep road ascent for 500m, then backtrack to end with a 500m uphill finish! Some fiddly bits through heather with hidden rocks, some wider rough tracks, boggy bits always included. Five layers on against freezing wind waiting for car park presentation; Camilla had given lifts to Peter, DFR runner and regular winner and Lucy 5th female, so car loaded up with wine/ chocolate winnings! Ok, I'll admit it, I wanted the GP points. And with that confession the story of how I came to be on the start line of my first ever fell race becomes a lot easier to tell. I'd eyed this one up earlier in the year when the fixtures were published, the need for kit including a map and a compass had almost put me off, but chatting to a few clubmates about the race assuaged my fears and with borrowed kit (thanks to Fiona, Katy and Jon! ), some very kind offers of chaperoning on the day (thanks Dave, Bill and Alister!) and the very welcome offer of a lift (thanks Graeme and Katy!) I thought I might as well give it a go. Basecamp was the local school with tea and cake on sale beforehand and plenty of space to change and leave bags and debate how many layers would be sensible with the other Striders. Compared to the snow, ice and hypothermia-inducing temperatures from previous years it was ridiculously mild and I really couldn't have asked for more from the weather. 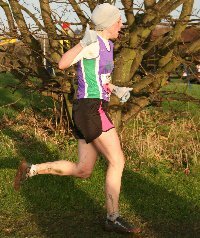 Sure, it was a bit boggy underfoot in places but even that wasn't as bad as XC and it was warm enough for me to remove my hat after the first mile and not to put it back on. That might also have been to do with the fact that the first mile is a 25% gradient uphill, I'd been warned that it was hilly to begin with but ouch! Fell racers are, in the main, sensible people though and tend to walk up the big hills, something I stuck to on the way round and probably was the best bit of advice I got. Once up the big hill we were on to the moors, a boggy track with some puddles to navigate over, a couple of sharp downhills, some more boggy bits, another ascent and then down onto a gravelly track before climbing back up again and along the top of a ridge. Then a very steep tarmac downhill, followed by an even steeper track uphill before some more moors and then the final welcome tarmac downhill. It was glorious out on the moors, although having to concentrate on where my feet were going most of the time meant there weren't too many opportunities to enjoy the view. I managed to escape unscathed though unlike Graeme who had fallen in a ditch and a lady behind me who had just been telling me about how she'd fallen over at the same point last year when I heard a crash and turned round to see her sprawled on the path having been tripped up by a rock. I even managed to have enough in my legs to out-sprint a very disgruntled woman on the line but in my defence it was downhill and I just couldn't stop (and I'd been trying to get past her for the last mile, that too)! Very chuffed with my finishing time of just under 1:54 and also very grateful for all the Strider support out on the course, I definitely couldn't have done it without the encouragement and advice along the way. 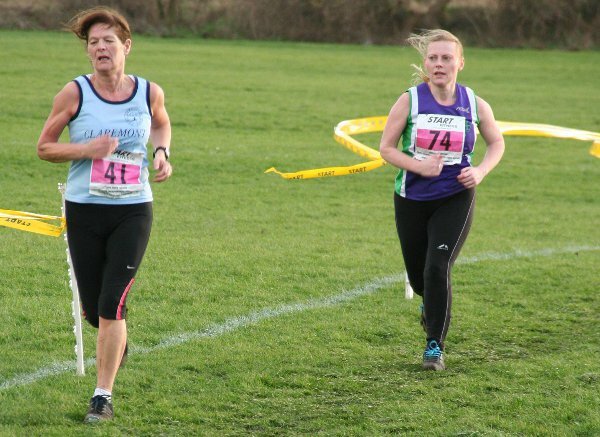 Some excellent Strider performances too with Shaun splitting the Waltons at the top of the field and the ladies teams finishing 3rd (Katy, Camilla, Me) and 5th (Anita, Angela and Sue) overall. The reward for finishing was a lovely cup of tea in the "Hexhamshire Hobble" mug that you got for finishing, and also a crack at the largest spread of cakes I have ever seen - perfect for tired legs. It may take me the best part of a month to get the mud out of my shoes but I really enjoyed my introduction to fell racing and despite the fact that I suspect I will never be as lucky with the weather again I will definitely be back! The start is from the GSK social club next to a huge GSK manufacturing site. It’s probably not quite as bad as the one around Europe’s largest Petro chemical plant, the Grange 10K in Scotland. The race blurb goes totally overboard describing it it as 'mostly flat out and back with a loop'. That’s a tad unfair as the half mile around the nice little hill and imposing buildings of the Manjushri Kadampa Meditation centre (formally Conishead Priory) that form the top loop is quite nice. 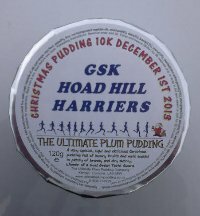 Slightly stiffer legs from the day before, a decent run and a Christmas Pud finish prize. It was cheap and I got a lift.